habitat), poor water quality, and reduced survival of young turtles causing the population to be skewed towards aged turtles that don’t reproduce well. and outcompete pond turtles for nesting and basking sites. 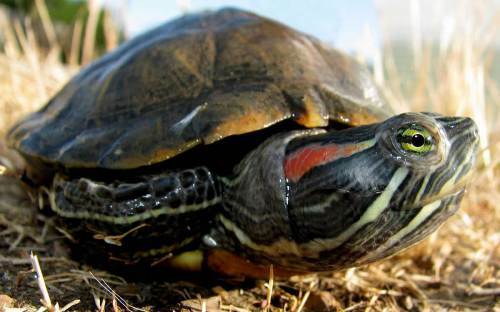 It is not known if disease is playing a role in the observed declines of western pond turtles. Additionally, introductions of non-native red-eared sliders into pond turtle habitat might also introduce new pathogens (disease causing agents like viruses, bacteria, fungi, and parasites) or strains of pathogens that western pond turtles had not been previously exposed to. Absolutely nothing was known about the pathogens western pond turtles are exposed to in California, so Janet Foley, Joy Worth and then Master’s student, Connie Silbernagel from UC Davis School of Veterinary Medicine, Deana Clifford from the CDFW Wildlife Investigations Lab, and Jamie Bettasco from the US Fish and Wildlife Service teamed up to conduct the first assessment of pathogen presence in western pond turtles across the state. The team also tested non-native red-eared sliders at study sites where both species were living to see whether or not red-eared sliders carried different pathogens and whether or not western pond turtles living in the same sites as nonnative sliders were more likely to carry different pathogens. The team found that both species of turtles carried Mycoplasma spp. bacteria (a cause of respiratory infections) with prevalence being highest at sites in southern California regions. 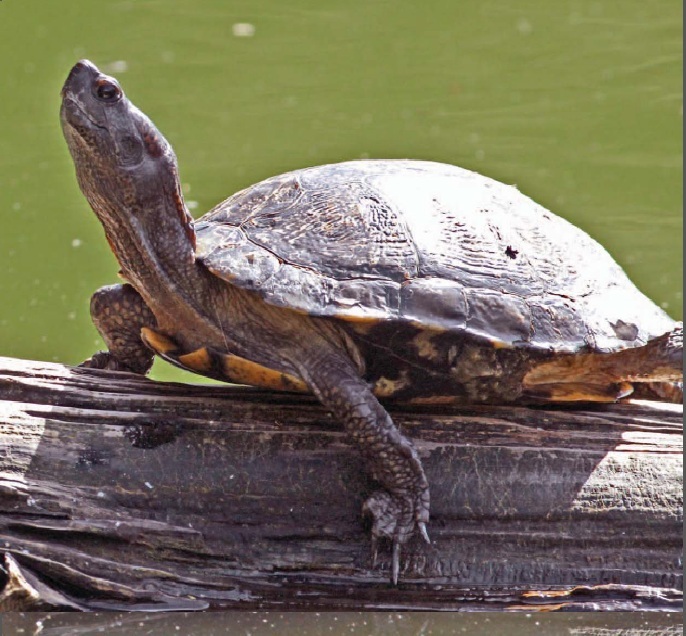 Furthermore native western pond turtles that were infected with Mycoplasma spp bacteria were more likely to weigh less and live in southern California. All turtles tested negative for two common viruses, Herpesviruses and Ranaviruses, and Salmonella bacteria (which can cause gastroenteritis and is a bacteria that can infect people). Dr. Connie Silbernagel tests the quality of a water sample. 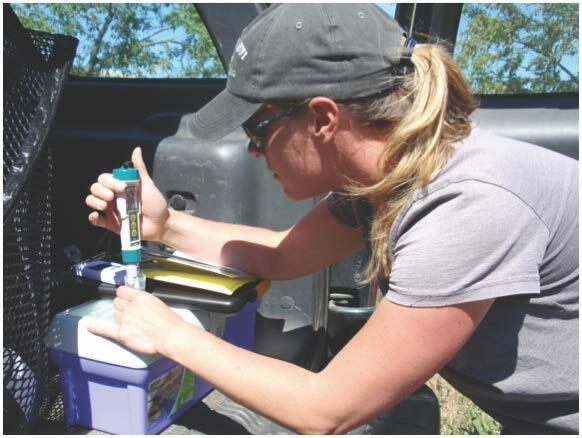 Connie earned her Master’s degree at UC Davis conducting the western pond turtle health assessment with CDFW and USFWS. 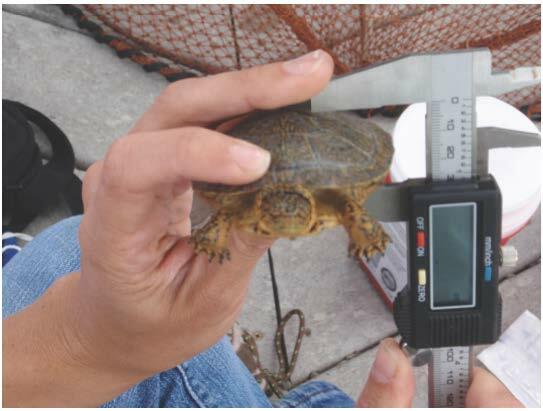 This study is the first of its kind to document pathogen prevalence in both native western pond turtles and non-native red-eared sliders and will provide important baseline data as we strive to conserve western pond turtles in California. Why is it important to report wildlife mortalities? recognize problems that could affect human and domestic animal health. WIL received 30 mortality reports submitted by the public from July 2012 – June 2013. These reports documented mortalities in 21 different species and have been added to a permanent record so that we may potentially be able to detect phenomena such as seasonal mortality trends or weather mortality events in the future. Public reporting makes a valuable contribution to the information we are trying to collect and is an important source for disease outbreak monitoring and emerging health threats. Please help us monitor the fish and wildlife populations in California. For more information on wildlife mortality reporting, please follow the links below. California will be the host of the 2015 Desert Bighorn Council Meeting. The meeting will take place in Borrego Springs, California in April 2015. This biennial meeting brings together wildlife biologists, scientists, administrators, managers, and others interested in the welfare of desert bighorn from the seven western states (Texas, New Mexico, Colorado, Arizona, Nevada, Utah and California) to exchange information, present research and take action on matters pertaining to desert bighorn management. The Council Chair for the 2015 meeting is Dr. Ben Gonzales, Senior Wildlife Veterinarian at the Wildlife Investigations Lab. The Program Chair is Steve Torres, Environmental Program Manager at the Wildlife Investigations Lab. Mark Jorgensen, former Superintendent of Anza Borrego Desert State Park will serve as Local Arrangements Chair. The Living Desert Zoo publishes an online magazine, FoxPaws. In article 7, issue 2 the zoo writes about an injured desert kit fox that WIL brought into their care last winter. Studying wildlife on nature’s terms can be difficult. Not only can the weather and topography be uncooperative, but the study species can pose challenges as well. One challenge is deciding if intervention is necessary and appropriate if an animal is found sick or injured. Here at the Wildlife Investigations Laboratory (WIL), we have veterinarians who can help make decisions regarding wild animal care. Deana Clifford, WIL’s non-game veterinarian, is also an epidemiologist and field biologist. With her diverse background in field studies and wildlife medicine, she is able to make important decisions while in the field or here at WIL. However, like many field biologists, she finds herself in remote areas far from home. In these situations, we rely upon local wildlife rehabilitation facilities for their time and care. The Tennity Wildlife Hospital and Conservation Center at the Living Desert Zoo in Palm Desert has partnered with WIL to provide medical treatment for sick or injured desert kit foxes (Vulpes macrotis). The desert kit fox disease monitoring project is ongoing and began in January of 2012 in response to a canine distemper outbreak that occurred at a solar development site in eastern Riverside County. 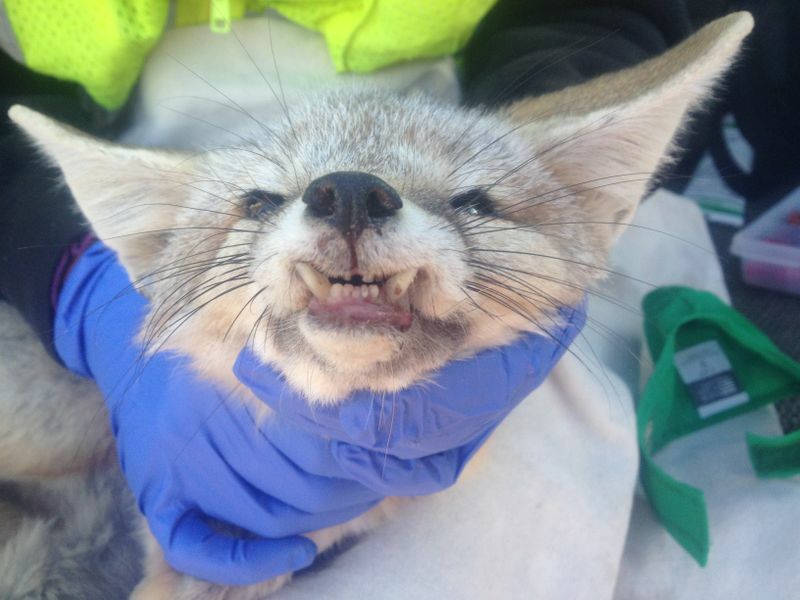 During our January 2012 capture effort, an adult male desert kit fox was suspected to have a broken jaw. The decision for intervention was made by Dr. Clifford, who quickly weighed many factors to decide if the risk associated with temporarily taking this fox out of the wild was mitigated by the benefit that would be gained from treatment. Key considerations for her decision making included: Was the injury significant enough to affect the fox’s chance of continued survival? Could the cause of the injury be associated with our trapping efforts? Could the injury be fixed allowing the fox to return to normal? Since this injury could definitely affect the fox’s ability to catch prey and potentially was repairable, we transported the fox to the Living Desert Zoo to confirm whether or not the jaw was broken, and if so, examine options for repair. Living Desert veterinarian Dr. Kevin Leiske consulted Dr. Yee, a veterinary dentist at Veterinary Dental Specialists, and a treatment plan was set up to care for the young male with the intent to release him back into the wild. After approximately 7 weeks of care, the fox’s jaw had healed. 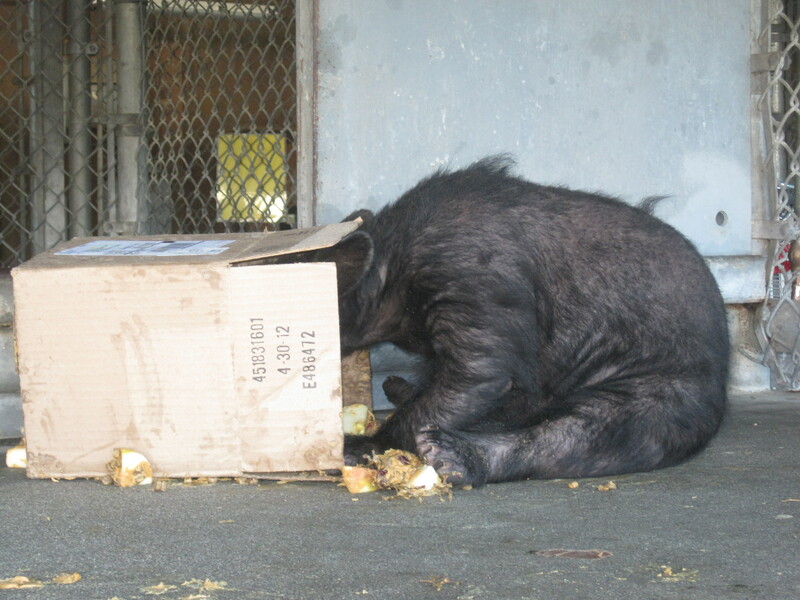 Before release, zoo staff made sure that the fox was able hunt and eat whole prey. 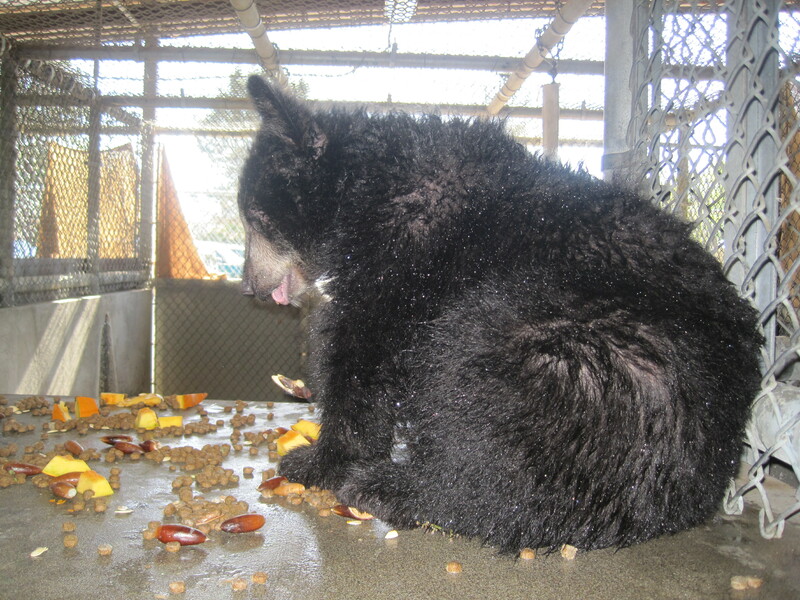 In March 2012 he was fitted with a radio collar and then taken back to the site where he was originally captured (under state department regulations, all wild mammals must be released within 3 miles of where they were found). Not long after release, the fox’s collar went “off-air” and biologists were unable to track him. Despite an extensive ground search by California Department of Fish and Wildlife (CDFW, formerly Fish and Game), biological monitors at the solar site, the Bureau of Land Management (BLM), and volunteers, we did not find the fox. In October 2012, CDFW took to the sky to listen for his signal, but again was unable to successfully locate this one fox. In January 2013, our concerns were finally laid to rest when we recaptured this male fox! His jaw is a little bit crooked but he was in good body condition and weight — clearly surviving and doing well back in the wild. We also discovered that his collar had simply malfunctioned and was no longer working. We then removed the collar and sent this fox back on his way to continue thriving in the wild. After WIL biologists discovered that the radio collar on this desert kit fox was no longer working, it was removed. Upon his release, he offered a unique photo opportunity as he rolled around on the sand – not far from biologists! Photo courtesy of Deana Clifford. There is always a risk when an animal has to be removed from the wild, even if it’s just for a few hours or days. Biologists understand this risk and must consider the benefits, if any, to the animal. Knowing the life-history and behavior of the study species is extremely important during the decision-making process. In this case, a young otherwise healthy male desert kit fox was found to have a potentially life-threatening injury that could be treated with minimal human contact. If we treated his injury and successfully healed the fracture, we felt that his probability of survival was much greater than if we knowingly released him with a broken jaw. A healed and healthy desert kit fox was recaptured this winter, one year after he was found with a broken jaw. Trained wildlife biologists are able to use physical restraint rather than chemical immobilization during desert kit fox physical exams. This allows us to quickly conduct exams and take samples without the use of drugs. In this photo CDFW volunteer biologist Teri Baker gently holds the fox while WIL veterinarian Deana Clifford documents his uniquely new physical feature – slightly protruding lower canines. This male fox was found to be in good weight and physical condition at the time of recapture. Photo courtesy of Deana Clifford. WIL would like to sincerely thank Dr. Kevin Leiske, Saldy Portacio, and the rest of the wonderful staff at Living Desert Zoo for generously giving their time and providing care to the desert kit foxes and other desert wildlife. 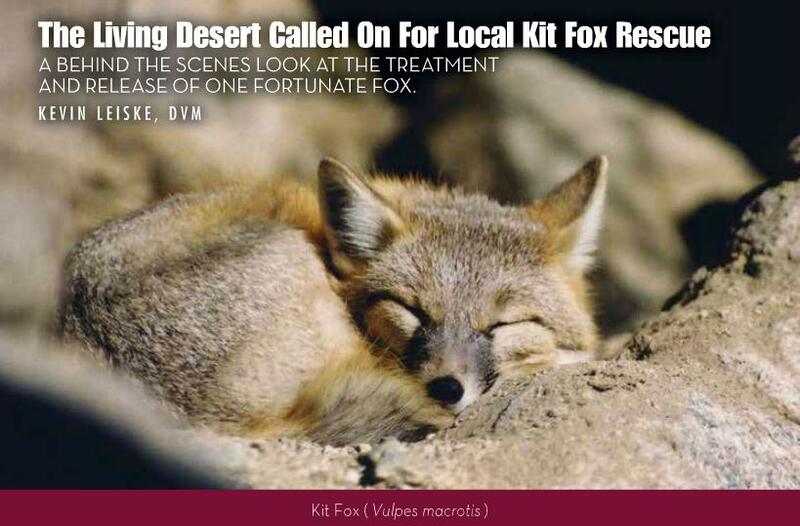 To read more about how the Living Desert cared for this desert kit fox, go to page 4 of FoxPaws Magazine. PLEASE NOTE: Only state and federally permitted individuals or organizations can lawfully rehabilitate wildlife. California Code of Regulations section 679 specifically addresses wildlife rehabilitation and has incorporated The Minimum Standards for Wildlife Rehabilitation written by the International Wildlife Rehabilitation Council (IWRC) and the National Wildlife Rehabilitators Association (NWRA). To learn more about the permitting process, please follow the link. Wildlife rehabilitation is a broad and complex field and it is continually evolving and progressing. Continued education is a critical factor when it comes to maintaining a professional knowledge-base at rehabilitation facilities. 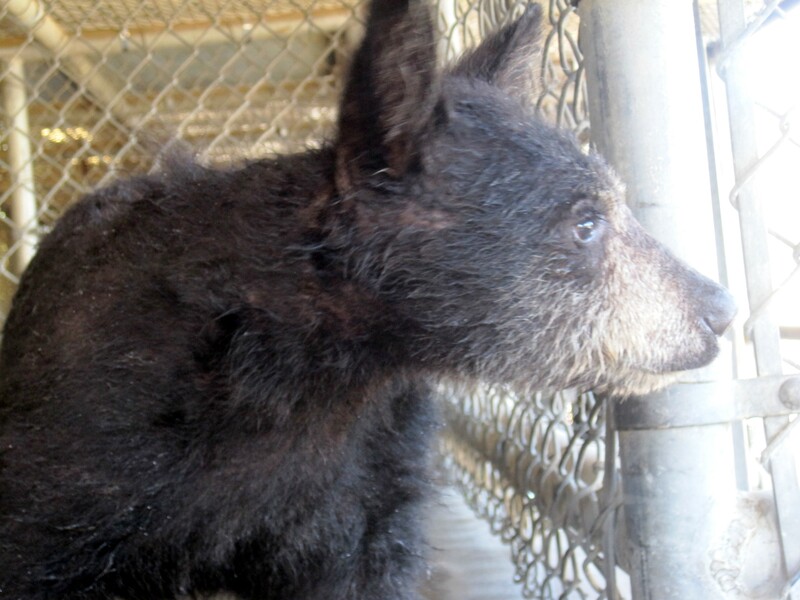 Because of this, the CDFW requires that all wildlife rehabilitation personnel (professional and volunteer) satisfactorily complete one approved wildlife rehabilitation training session each year. The minimum for these sessions is 2 hours. 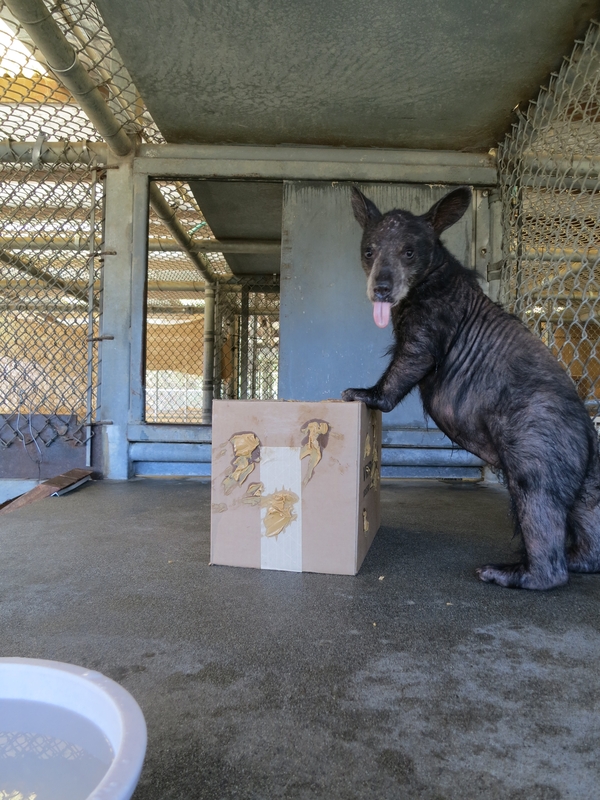 Click here for more information on wildlife welfare and rehabilitation and for a complete list of wildlife rehabilitation facilities in California. 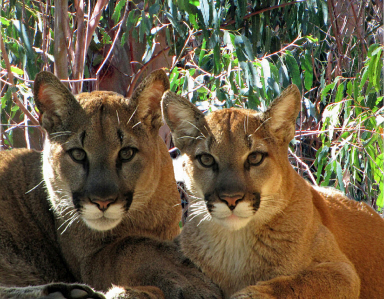 Four years ago, the Wildlife Investigations Lab was involved in caring for two mountain lion cubs that had been victims of abuse at the hands of poachers. Now that the prosecution of the poachers has concluded, their story can be told. Many wonderful groups and individuals have been involved in this case, from the care of these lions to the legal prosecution of the offenders. Please follow the links below for their story details. While the future President Roosevelt was referencing bighorn sheep (Ovis canadensis) of the North Dakota badlands, his description can be applied just as aptly to the Sierra Nevada bighorn (O. c. sierrae) of California’s east-central boundary. The rugged mountain peaks and canyons combined with semi-open forest areas provide ideal habitat for these bighorn. An alert group of Sierra Nevada bighorn. 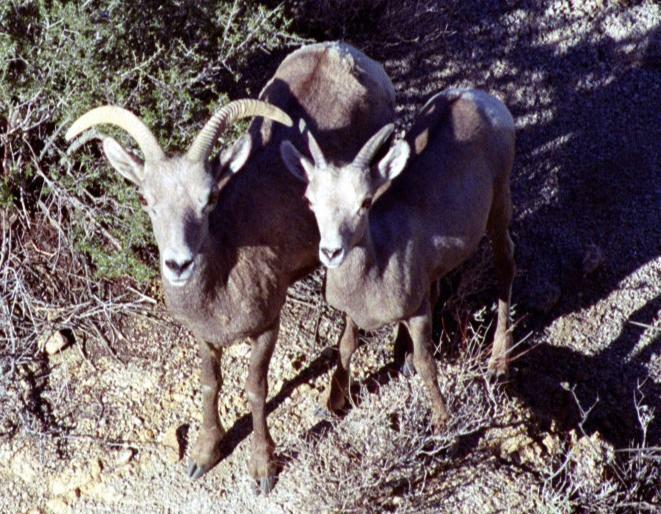 Sierra Nevada bighorn sheep (SNBS) are an endangered genetically distinct subspecies of bighorn. They are only found in the mountain range that provides their common name. Today, these sheep are on the road to recovery, in part thanks to intense monitoring by the Department of Fish and Game’s Sierra Nevada Bighorn Sheep Program (SNBSP) in conjunction with the Sierra Nevada Bighorn Sheep Foundation. Led by Dr. Tom Stephenson, the program’s goal is to recover sheep numbers to the point that downlisting, or the ultimate goal, delisting, would be warranted. Recovery activities center around understanding and managing factors that influence population health and the distribution of these bighorn. Among the factors that could be limiting Sierra Nevada bighorn numbers are disease from domestic sheep, predation, weather events and forest succession, which may limit habitat. Indeed, the preferred haunt of the bighorn is open habitat adjacent to steep and rocky ground. They are behaviorally and morphologically suited for such an environment. Bighorn are equipped with keen binocular vision to detect predators from a great distance. Their short legs, hefty frames and low center of gravity provide agility and tremendous balance. Their hooves are hard on the outer edges and spongy at the center, a unique adaptation that facilitates exceptional grip on rock. When danger is perceived, the sheep make the most of their physical abilities by retreating into the nearby cliffs and rock walls where few predators can pursue them. A home fit for a sheep. While it is true bighorn are first-rate predator evaders, they have historically had a harder time avoiding another serious threat: humans. It was during the mid-1800s that Sierra bighorn sheep numbers began to decline. Throughout this time California experienced a population boom due to the discovery of gold. Once the gold rush craze eased up, settlers that remained in the area turned to ranching. Domestic sheep and cattle began grazing the Sierras, increasing forage competition. At the beginning of the 20th century, bighorn numbers were down to the thousands. Domestic sheep graze in the Sierras. Grazing sheep and cattle on western federal lands became the subject of a sizzling congressional debate. 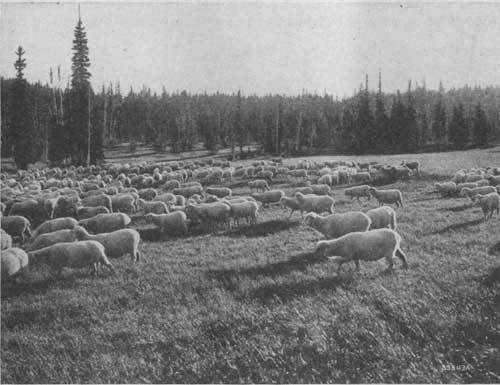 President Roosevelt was neither a fan of forest grazing nor of domestic sheep themselves – he described them as “the most foolish of all tame animals” and referred to flocks as “fleecy idiots.” A quarrel over sheep grazing created a rift between legendary conservationists John Muir and Gifford Pinchot. Pinchot assured Muir he was against sheep grazing in forest reserves. Muir furiously confronted Pinchot over quotes in a Seattle newspaper that suggested otherwise. Disagreement between wool growers and preservationists was high, which ultimately led to grazing regulations and agreements. While forage competition and over-hunting played a role in bighorn population decline, today one of the most critical threats to Sierra Nevada bighorn recovery is disease transmission from domestic sheep . Domestic sheep are carriers of pathogens that cause respiratory disease in wild sheep. While domestic sheep remain unaffected, bighorn that are exposed have no defense against these pathogens and are therefore extremely susceptible to disease and ultimately death. Recent pneumonia related all-age mortality events have resulted in the deaths of hundreds of bighorn in the Rocky Mountain West. Research implicates a particularly difficult-to-diagnose bacteria, Mycoplasma ovipneumoniae, in initiating many of these outbreaks. While Mycoplasma ovipneumoniae is commonly found in healthy domestic sheep, years of extensive testing has demonstrated that this bacteria is absent from Sierra Nevada bighorn herds. This absence certainly results in healthy bighorn, but it also means that the wild herds will be very susceptible to respiratory disease if they are exposed to the organism. Once exposed, the typical sheep habit of nose-to-nose greetings can result in the unstoppable transmission of the organism within the herd. Extensive ram movements can then spread the disease to other populations. 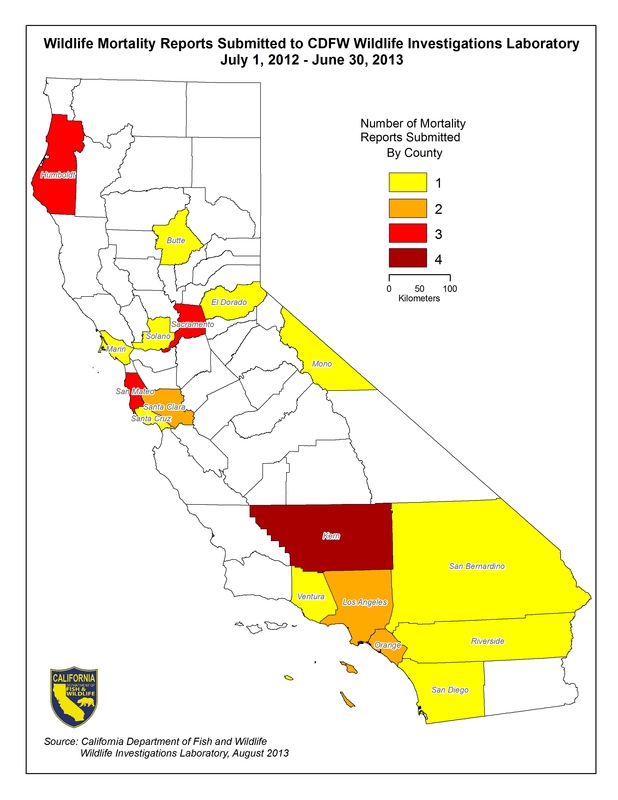 Historically, these disease outbreaks have resulted in initial all-age mortality followed by years of high lamb mortality, both of which will delay or prevent the recovery of the Sierra Nevada bighorn sheep. 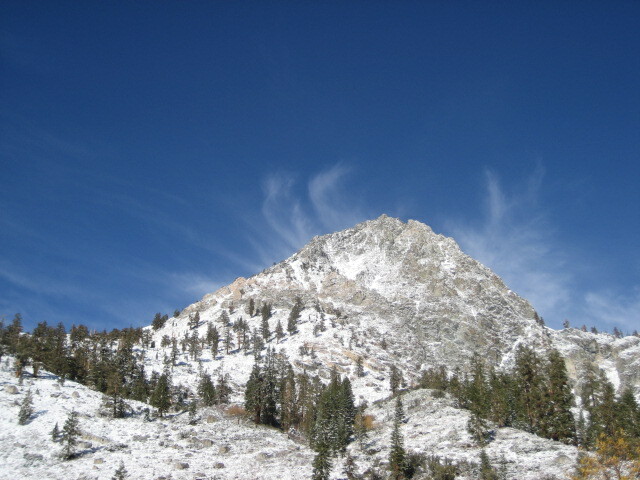 By the mid-1990s, an estimated 100 bighorn remained in the Sierra Nevada region. Such low numbers expedited the process of listing the sheep as endangered; in 2000, the Sierra Nevada bighorn sheep became the first federally endangered species listed in the 21st century. WIL veterinarian Dr. Ben Gonzales lends his expertise in monitoring the health of each sheep that is flown in. 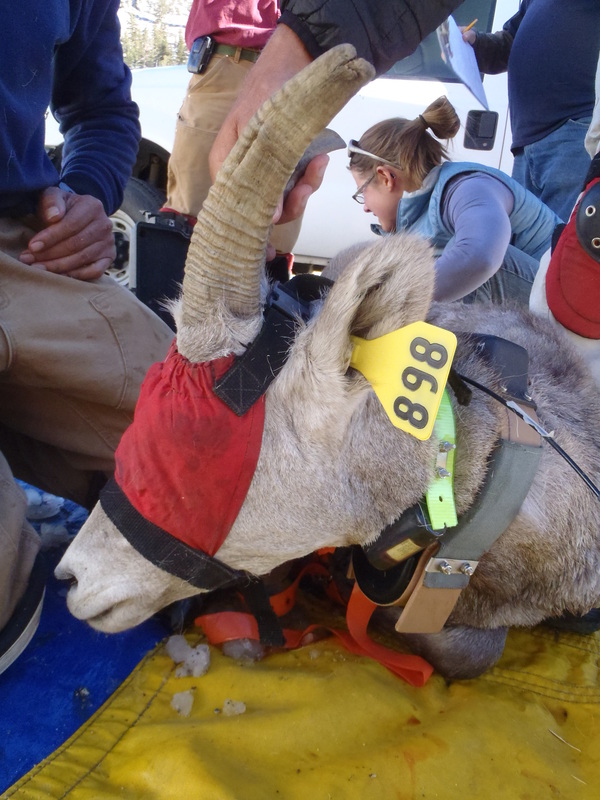 Crew members are trained to closely monitor the bighorn and to collect appropriate blood and nasal samples to evaluate population health. 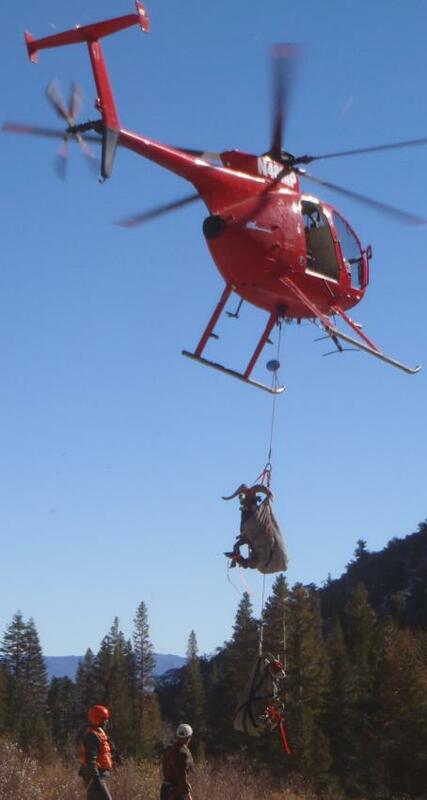 After the team fits the collars and applies an ear tag, the bighorn is then airlifted back to the capture site where it rejoins the flock. The collared sheep will then begin to accumulate data that is imperative to their recovery success. 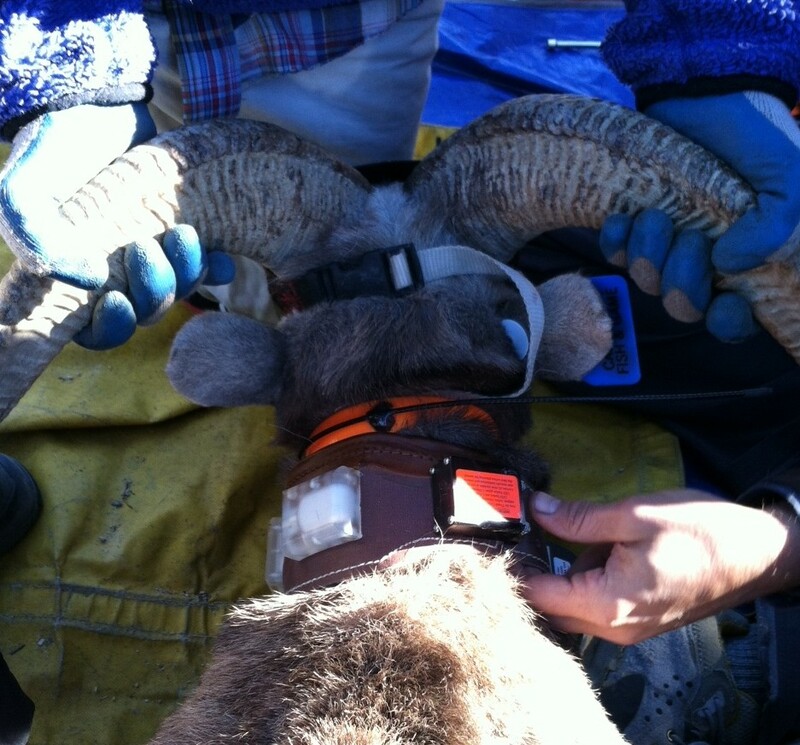 The radio and GPS collars are very useful and important tools in the recovery process for these animals. Movement patterns, habitat use, survival and causes of mortality can all be examined. Radio and GPS collars are securely fastened on a ram. Furthermore, human recreational impact on the bighorns can be assessed, as well as the grazing overlap between bighorn and domestic sheep. The collected data will allow for science-based management decisions to be made in order to ensure the survival of Sierra Nevada bighorn. 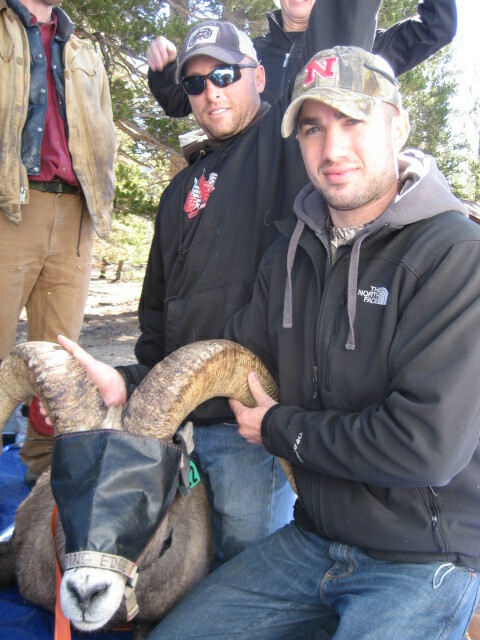 So far, efforts have helped increase Sierra Nevada bighorn numbers to over 400 individuals. President Roosevelt went on to describe bighorn sheep as having “…no animal in the world his superior in climbing…” With successful recovery efforts, the SNBS Program and the Sierra Nevada Bighorn Sheep Foundation in partnership with the Wildlife Investigations Laboratory will help guarantee that these rare bighorns remain the ultimate mountain climbers well into the future. 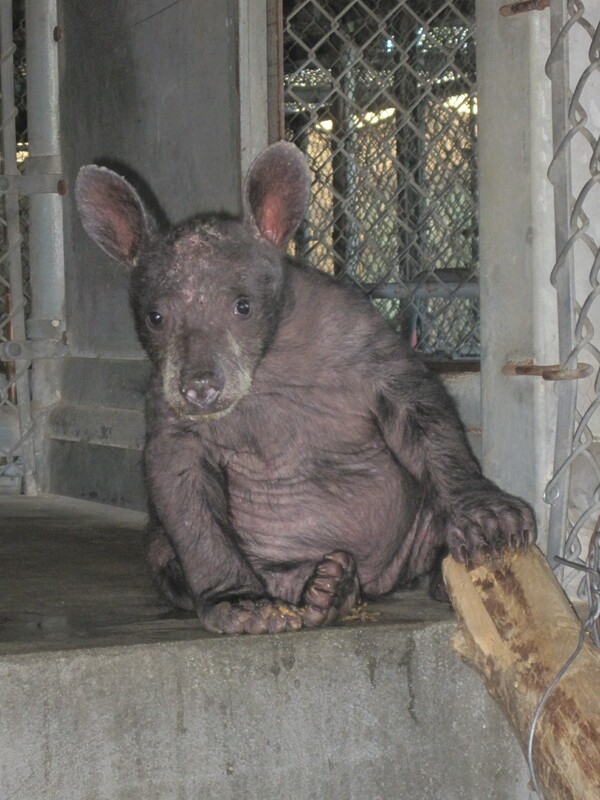 Since July, the Wildlife Investigations Lab (WIL) has been caring for a black bear cub that had been stricken with mange, ringworm and bacterial skin infections. Although she still has some patches of thin hair and scarring on her back from the severe wounds she incurred, she has made wonderful progress and is almost fully recovered. 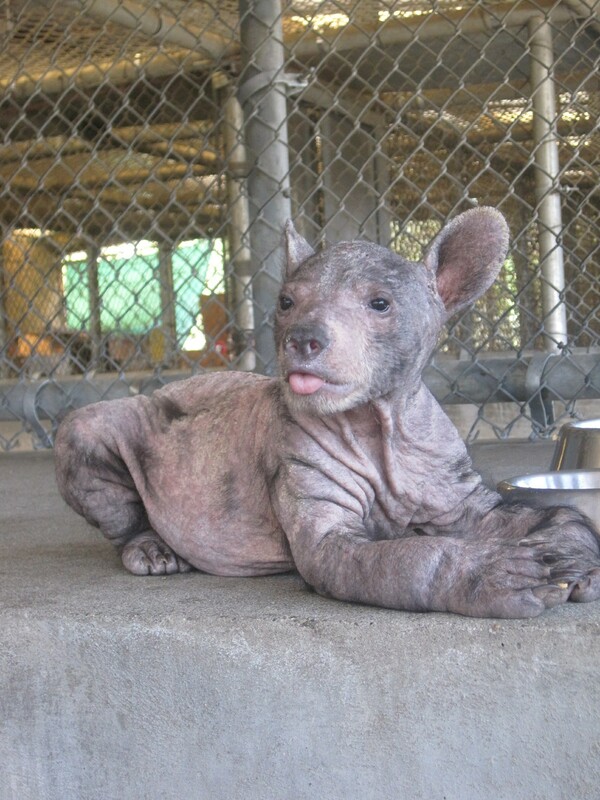 As her stay at WIL comes to an end, her next adventure begins at the Gladys Porter Zoo in Brownsville, Texas. While we are sad to see her go, we know her new caretakers will be excellent guardians. You can learn more about her and how she came to the WIL by following the link. To catch her playing in her pool (and attacking an artichoke) click here. Weel 8. Photo courtesy of WIL volunteer Jamie Sherman.